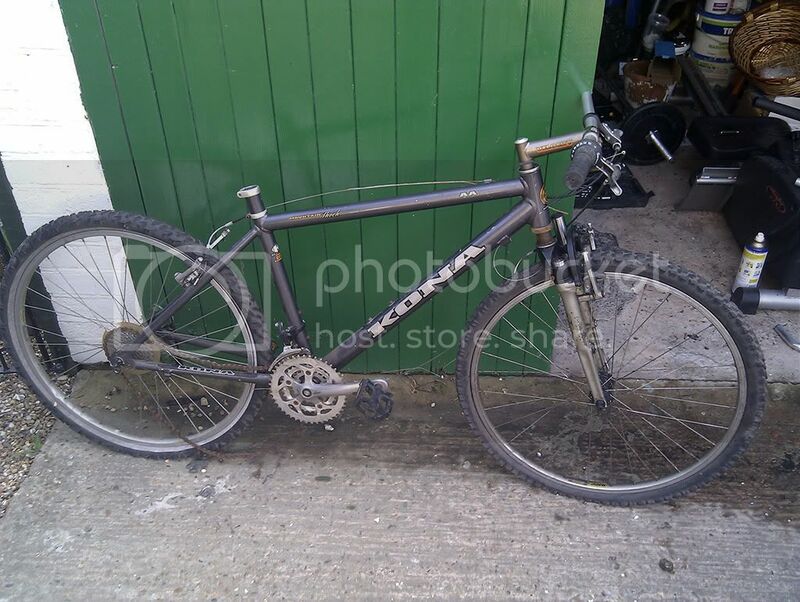 Yesterday i took ownership of a very tatty Kona..
No seat or seat post. Chap said he's got them floating about somewhere and he'll dig them out if i want them, definitely think i will for the seat post. one thing that does worry me is the bubbling paint near the bottle cage mounts..surely aluminuim doesn't corrode?? could someone help me translate it? Massive thanks to Anthony for some amazing advice and information and to rojo for being more excited than i am! as for your bike: seems that it just been garaged since ages and gathering dust. dismantle the hole lot to the frame and give all parts you are keeping a good clean. check the frame and give him also a good clean / T-cut / polish and it will stay out nice. Anthony is your man for info, sure he'll be along on here in a bit to guide you through and technicalities. Not sure about the paint, mabe it is just bubbling an d lifting, as you are right, cant corode. I see no problems, only opportunities. It looks as though everything that's there is original, except for the LX M600 V-brakes and levers, which were an almost universal upgrade in 1997 and still work very well indeed. If so, the wheels and tyres alone are worth more than you paid for the bike - Mavic 237 on Kona suspension front / LX rear, with Mr Dirt / The Cleaner tyres. Like everything else, they just need to be taken to bits and cleaned/lubed and then everything will look a lot better. The paintwork looks pretty good to me, just needs cleaning and a bit of touching in. I wouldn't worry about a bit of bubbling - it isn't causing any damage, but you could file it off and repair it if it offends your eye. I actually have one of those forks in working order if you wanted to do a period-correct build, but tbh you would probably be much better off with a Judy XC or Z-series Bomber for it. 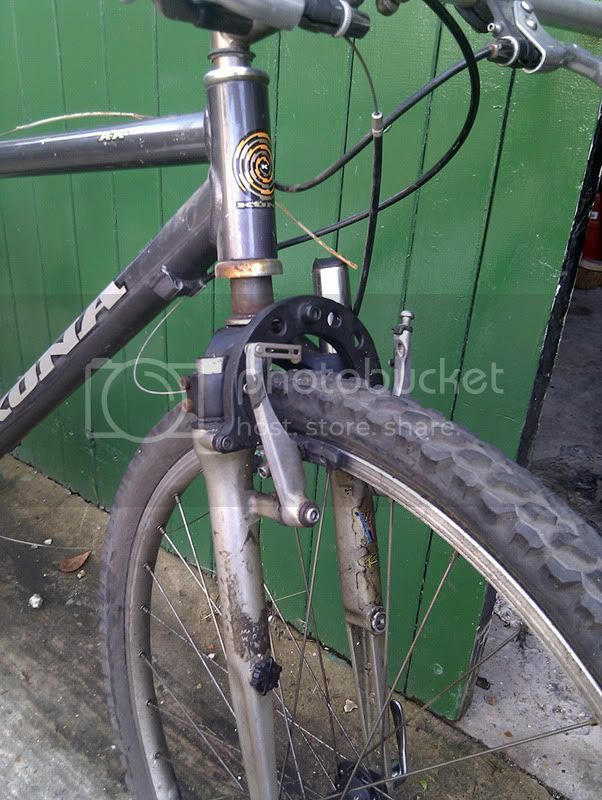 It would be well worthwhile chasing him up for the missing rear mech (XT), the saddle (worth 15-20 if in ok condition),and the rest of the Impact headset, as it would be a pity if it was MIA. As to what you've got there, the Sugino Impel cranks look ok from here, you have the LX front mech, the stem which looks in good order and is worth a tenner or more and the original reasonable handlebar. Somebody seems to have done you a favour and put the left hand Gripshift SRT-600 in the bin, which is a good hint for what to do with the rh one. 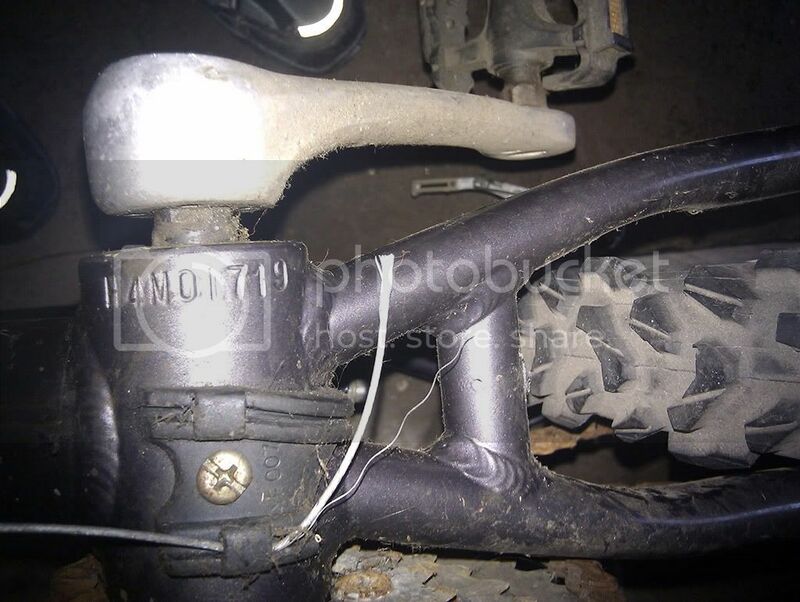 And even if the frame was useless, believe it or not the seat clamp is worth 5-10 and the cable guide must be worth 15 in the rare 31.8 size. We mustn't get carried away though. 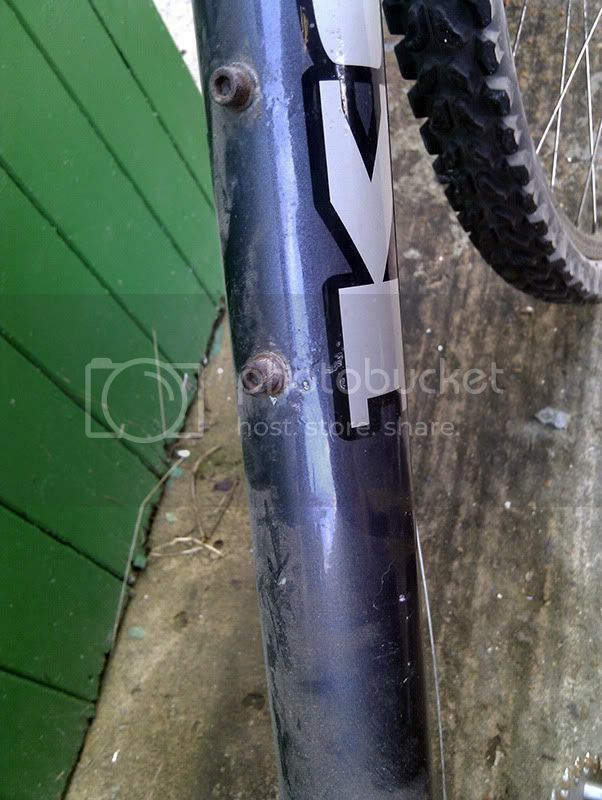 We all have the experience of cleaning a frame like that and finding a crack, which in this case would be fatal. You would still be way ahead on the money, so not a tragedy, but I do think you should strip the bike down as soon as you have an opportunity and as you clean the frame have a really close look for any hairline cracks. I'm not saying these frames were prone to it, but just that until you've done that check, you can never really declare yourself content with your new addition to the family. Subject to that, I can see this bike as being quite a fast cross country charger by the time you're finished with it. you can see the potential. I'm very torn between trying to keep it original(ish) or going a little neo-retro (or whatever they call it). The headset is a terrible mess, so unfortunately thats a-goner. The front tyre is original, but the back is not. both seem in reasonable condition though the back one will be first in the bin when it goes. I'm thinking this may have semi-slicks on it for the time being after i lost my other bike to the missus. I've got a long cage XT mech sitting underneath my desk, so i'll be digging that out (if it fits) but i'll be chasing him up at the weekend for all the outstanding bits. the cogs are in pretty decent nick, though the middle front is showing some signs of abuse, the back ones will be fine after a clean and polish. the only thing i'm not sure about is the chain. as it's a total write off and the cogs are well used, i should be looking at a used chain too, right? a little thought if i do try and clean up the paint chips, as there are a LOT! how easy is it to paint match ? spot thing from halfords, or is it a little more hassle than that? i think that's it for now, it's still stupid o'clock and i should be getting ready for work, not posting up here..
No play in the BB, middle cog may not be as bad as i thought. Starting the cleaning and polishing tonight and over the weekend, so was wondering if anyone had had any thoughts on the paint and how to match it? magas' idea of humbro was quite good, failing that should i just take he frame to Halfrauds and see what they can do? Yeah, spot on with paint idea. If you are going to overhaul everything I'd take the Bottom Bracket out and clean the threads and reinstall it, but personal choice. Thanks coomber. I'll take it to halfords, and then the local model shop. If it is smooth I wouldn't worry about it, but for info they are really simple to remove. Just need to make sure you are unscrewing each cup the correct way. I had the same trepidation first time I starting taking bikes to bits last year but its not one of the harder things.